Using an indoor TV outside will void your warranty. SunBriteTV, All Season, Peerless-AV, MirageVision, Sealoc, Séura, Samsung and Toshinaer TVs are all built to live outside. Outdoor TVs are built to withstand the corrosive air that comes along with living near saltwater. Indoor TVs aren't so lucky. If your sprinkler goes out of control, your outdoor TV won't mind if it gets a bath. You won't have to carefully follow the weather with an outdoor TV. Whether it's a sudden thunderstorm or a blizzard, you won't have to worry about your TV being out in the elements. You can use and operate your outdoor TV in moist or wet conditions...without the fear of being shocked! Our Outdoor TVs come with a waterproof remote! High humidity does not get along with electronics, however outdoor TVs are the exception to this rule. Their exceptional ventilation keeps them running even in the most humid environments. BUGS! Insects like small confined spaces, and indoor TVs have a lot of them. Outdoor TVs are sealed and protected from curious little creatures. Indoor TVs are hard to view outside. 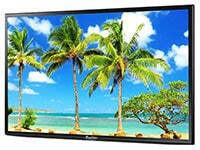 Outdoor TVs have a brighter screen, thus making them MUCH easier to view in the bright outdoor light. Outdoor TVs look cool! And your house guests or business' customers will definitely be impressed.